Students learn science best by doing science through inquiry. The ByDesign program focuses on providing this experience to students. God designed His children to wonder, question, and learn about their environment. In the Garden of Eden, Adam and Eve were encouraged to explore and share what they had learned with God and the angels (White, 1903). This type of learning was also encouraged in the schools of the prophets (White, 1913). 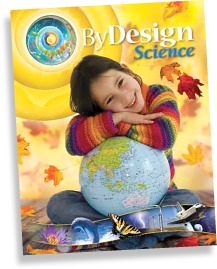 ByDesign is built on a foundation of inquiry that encourages wonderment, questioning, exploration of multiple resources to conduct research and investigations (i.e., textbooks, informational books, articles, websites, pictures, observations, hands-on activities, etc. ), and collaboration. In general, “inquiry is a way of looking at the world, a questioning stance we take when we seek to learn something we don’t yet know. And when we are truly inquiring about that something, whatever it may be, we drive ourselves to learn more and more because we are seeking answers to our own questions” (Parker, 2007, p. 1). Response—learners receive non-threatening feedback, encouragement, and support toward their further development. By Design has a strong foundation based on a 5-part instructional model. This teaching model is used to promote inquiry-based learning and to stimulate a natural desire for knowledge and better understanding of God’s Creation. Capture students’ attention with a question that relates to the concepts that are being introduced. Spark students’ interest, determine prior knowledge, and focus attention on the content in the upcoming lesson. Students participate in one or more activities to explore the concept. This discovery provides students with a common set of experiences. Students learn by performing investigations using hands-on activities and scientific methods. Students build their own explanation of a major idea, and the teacher helps guide their understanding of the concepts. Students read content and interact to develop scientific literacy. Students extend and build on their understanding of the concepts by applying the content to other subject areas in order to develop greater depth of knowledge. Students complete an activity that will help them and the teacher evaluate their understanding of the concept presented in the lesson and chapter. Checking for comprehension and understanding is ongoing throughout the learning experience.